(2) Most or all of the civic architecture is at the BOTTOM of the hill. At the Aztec site I'm working on, Calixtlahuaca, the housing was built on terraces and covered the sides of a small mountain (2-3 sq km total). The heaviest occupation was on the north face (the right slope in the above photo). The royal palace was built on the plain at the base of the hill, and the main temples were built on huge terraces near the base of the hill. There were also some (now destroyed) temples on top of the hill. 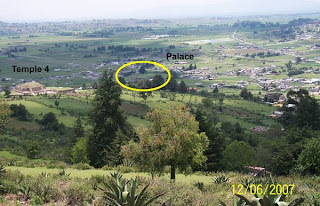 The second photo, looking down from about 2/3 of the way up the hill, shows one of the large temples, and the palace is barely visible at the base of the hill (yellow ellipse). 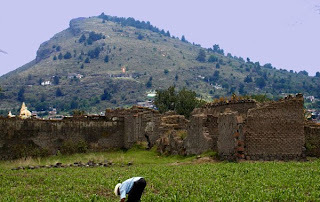 Most Mesoamerican cities whose housing covered hillsides had their civic architecture on top of the hill (Monte Alban, Xochicalco, many more examples), and defense was a major consideration. At Calixtlahuaca, they put a lot of effort into living on terraced slopes and building big terraces for their temples, yet there are no defensive features (walls, ditches, caches of weapons, etc.) and the royal palace was the most exposed building in the city. I'd appreciate hearing about comparative examples that might help me understand this strange urban layout. 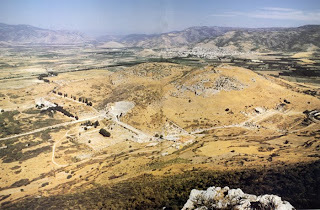 Someone suggested Ephesus, which seems to fit, although I can find no information about the hillside housing. The excavated "slope houses" or "terrace houses" at the site are in the civic center, not up on the hillsides. Are there other examples of ancient cities with these traits? And can they help interpret Calixtlahuaca, or do the idiosyncratic factors of each site dominate, making comparisons like this superficial and not informative? Its Open Access week again. I am reminded about all the very nice online publishing efforts that get reported in this blog. As a New World archaeologist, I am envious of Old World archaeology for leading the way here. If you have (1) done peer-reviews for, (2) submitted an article to, (3) written a book or media review for, or (4) taken on the editorship of a scholarly journal published by giant firms such as Springer, Reed Elisevier, or Wiley, then you belong to a very large group of very well-educated people whose unpaid labor has helped make these firms very profitable. Their profitability in turn has positioned them to work vigorously against the interests of (1) university presses and other not-for-profit publishers in the public interest, (2) libraries at all levels, (3) university and college students, (4) scholars themselves, and (5) particular and general publics with a need to consult the scholarly record." So I won When on Google Earth again! 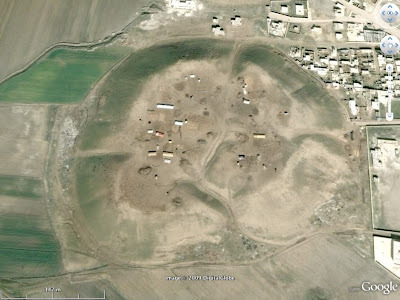 I correctly identified Mike Koeth's site on WOGE 75 as Hamadan Iran. I'm pretty sure Heather will recognize the site and confirm herself as the champion WOGEr once again! A: The first person to correctly identify the site, including its major period of occupation, wins the game! You can follow along on the Facebook group. Patricia Rubin, NYU Institute of Fine Arts director, has announced the death of Dietrich von Bothmer (statement). Lee Rosenbaum has commented on the news, and a notice has appeared in the New York Times. The School of Human Evolution and Social Change at Arizona State University has an opening for a post-doctoral fellowship in comparative urbanism. This position is with a transdisciplinary research project called "Urban Organization Through the Ages: Neighborhoods, Open Spaces, and Urban Life." This project has six faculty PIs, including three Mesoamerican archaeologists, a geographer, a sociologist, and a political scientist. We are gathering and analyzing data on urban life from ancient, historical, and modern studies. We are looking for a scholar with comparative interests and good resesarch skills to manage a team of student workers, and to become part of the project intellectually and professionally. Interested scholars (and other readers of this blog) can find more information about the project at our web site, with a link to the formal discription of the post-doctoral position. Readers may be interested in the Early Jewish Monotheisms project based at the University of Goettingen. The project is directed by Nathan MacDonald of the University of St. Andrews. The origins and development of monotheism in ancient Israel has been one of the most significant debates within the study of the Old Testament of the last thirty years. It has generated numerous books and articles and resulted in a significant shift in the scholarly consensus and added considerably to our understanding of ancient Israelite religious life and thought. Unfortunately, the discussion is frequently concluded prematurely with the exilic ‘breakthrough’ to monotheism by Deutero-Isaiah. A significant part of the problem is that a particular account of the nature of monotheism is held by interpreters. In this account monotheism is a stage of religion, which once reached is perceived to be self-evident to its adherents. Consequently regression into polytheism has been viewed as inconceivable. Additionally, monotheism was held to entail certain consequences, including universalism, anti-superstition and magic, ethical, aniconic. Thus, when scholars determined that Deutero-Isaiah was a monotheist, who was thought to exhibit these beliefs, it was held that true monotheism had been reached. The complicated and sophisticated history of religious change in ancient Israel had reached its goal. It is clear though that, however different early Jewish beliefs are from those of their ancestors, there existed considerable diversity in the way that Jewish belief in God and the world was conceived and articulated. In his introduction to monotheism, published in 1996, Fritz Stolz identified at least four broad categories of monotheistic thought: priestly, deuteronomistic, wisdom and apocalyptic. Representatives of these traditions show a strong commitment to the one God of Israel, YHWH, but what that means in terms of their theology and their practice can be quite different. This diversity within Jewish monotheism becomes even more apparent in the late second temple period, when we have an abundance of information about the theology and practice of the diverse groups that make up Judaism. responses to the existence of evil. The project has a strong contemporary resonance because of concerns expressed about the relationship between monotheism, hegemony and violence. An academic project that examines uniformity and diversity within early Jewish monotheism is important not only for the light it can shed on the history, literature and theology of the biblical texts and the second temple period, but also because it touches on issues of contemporary interest. It is a working hypothesis of the group that some of the equations of monotheism and violence are too simplistic and fail to take account of the diversity present in historical and contemporary forms of monotheism. The Sofja-Kovalevskaja Research Group works in close collaboration with the other related research projects in the Theologische Fakultät, especially the DFG-funded Graduiertenkolleg, “Götterbilder – Gottesbilder – Weltbilder”, and with the two established Old Testament professors, Prof. Hermann Spieckermann and Prof. Reinhard Kratz. The research project runs from 2009-14 and is funded through an award of €1.65 million made by the Alexander von Humboldt Foundation to Dr Nathan MacDonald with the funding provided by the German Federal Ministry of Education and Research. The project also has a blog, which already has several interesting posts on it. The lauch of this project will be formally launched with a reception at this year's SBL annual meeting in New Orleans (at 9pm on November 23rd 2009 in Orleans/Rosalie/St Claude in the JW Marriott New Orleans). There will also be a new program unit at SBL connected with this subject. The project web site also lists other ways researchers can get involved. The Oriental Institute of the University of Chicago invites applications for the Oriental Institute's Annual Post-Doctoral Scholar Conference program for the 2010-2011 academic year. This is a twelve-month, non-renewable appointment. The Post-Doctoral Scholar will organize and conduct a two-day conference at the Oriental Institute on key comparatively oriented theoretical or methodological issues in the field of ancient studies (archaeological, text-based, and/or art historical avenues of research). We encourage cross-disciplinary proposals that deal with the ancient Near East (including Egypt) or that compare the Near East with other cultural areas. Applicants should take into consideration the research interests represented at the Oriental Institute. The conference will take place in early to mid March 2011. After the conference, the Post-Doctoral Scholar will work with publication staff to assemble and edit the proceedings for publication in the Oriental Institute Seminars series. The incumbent is also encouraged to pursue his or her own research while in residence and to interact with the Oriental Institute community. See information on past Oriental Institute Annual symposia here.